Hurricane Florence is moving toward South Carolina as maybe the most powerful storm the state has seen in recorded history. The only bright spot was that Sunday's forecast put the most likely track of the storm and its strongest impact on the coast north of most areas in the state. If Florence makes landfall, it would be expected midday Thursday at the earliest. Gov. Henry McMaster on Sunday urged all South Carolina residents, whether they live on the coast or further inland, to make preparations for the potential mess Florence could bring. He invoked one of state's most devastating storms to make his point. "I'd say get ready. The winds on this one are predicted to be more powerful than the ones from Hugo," McMaster said in a midday press conference, referring to the 1989 hurricane that hit South Carolina as a Category 4 storm, with winds that blew at 138 mph and had recorded gusts of more than 160 mph. "Pretend, presume, assume that a major hurricane is going to hit smack dab in the middle of South Carolina and may go way inshore," McMaster said. On Sunday evening, the Florence storm had grown to 85 mph winds and was getting stronger. It was moving toward the Atlantic seaboard at about 7 mph. The National Hurricane Center continued to give a range of possible landfall anywhere in South or North Carolina and specialist Eric Blake said the risk of Florence making landfall as a destructive hurricane had increased. The storm's winds could be as powerful as 140 mph — a Category 4 storm, said Mark Malsick, severe weather liaison of the S.C. Climate Office. The storm also is forecast to meander or stall once it gets inland, bringing flooding rain to an already soggy state. Emergency managers are eyeing the prospect of the storm’s rain catastrophically flooding at least part of the state for the third time in four years. The storm is also expected to get bigger, extending the reach of its winds and rain. 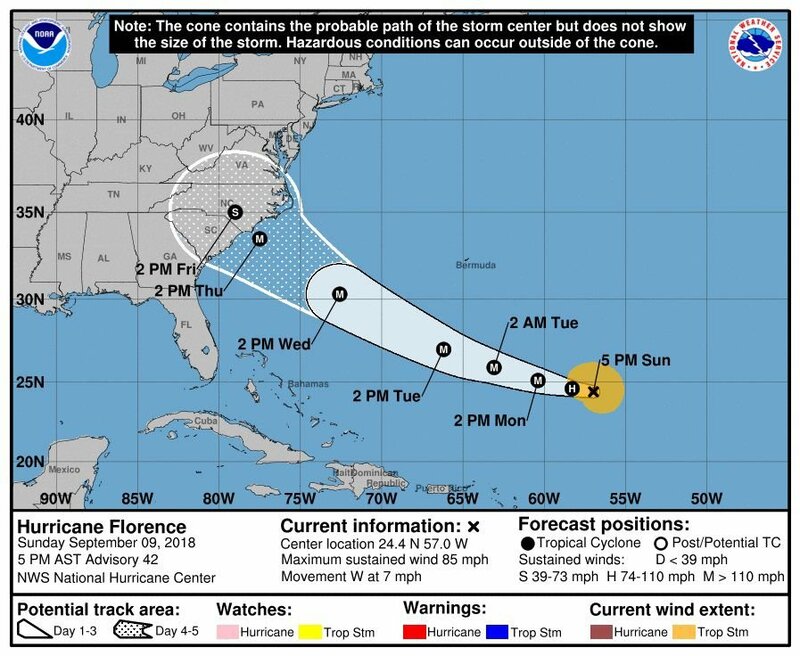 “A direct hit from Florence could happen anywhere along the swath of coast from Georgia to Massachusetts, with North Carolina being at greatest risk,” meteorologist Jeff Masters, with the private company Weather Underground, said. “Florence might then stall and wander near or over the coast for as many as six days, becoming the ‘Harvey of the East Coast,’ dumping prodigious amounts of rain,” he said. Coastal South Carolina should start to feel the storm’s winds Wednesday. Surf already was beginning to rise along the coast Sunday but the giant swells associated with hurricanes also won’t be expected until Wednesday, meteorologist Doug Berry with the National Weather Service office in Charleston, said. How much wind and rain Charleston, the coast and the rest of the state gets will depend on just where the storm goes, he said. A higher risk of dangerous rip currents already was in place Sunday. With computer forecast model runs coming into more agreement, some private meteorologists began to focus on the coast between Charleston and Morehead City, North Carolina as the most likely area if the storm makes landfall. "This storm is looking to make landfall with highly destructive winds and prolonged torrential rainfalls while slowing down to nearly stationary. It is slowly becoming a worst case scenario event," said Charleston-base meteorologist Shea Gibson. "Catastrophic flooding is becoming more and more of a reality for eastern North Carolina and portions of the Mid-Atlantic," he said. McMaster has submitted to President Donald Trump a request for a federal emergency declaration in anticipation of the possible impact from Florence. The governor is requesting the availability of federal resources should the storm make landfall in the state. The request, if approved, would also make state and local agencies eligible for reimbursement through FEMA for certain costs related to emergency measures taken during the storm and for debris removal, if necessary. Virginia and North Carolina made similar disaster declarations. Additionally, officials noted that FEMA officials will be heading to the state Monday to begin making plans should the state need to execute evacuation plans. McMaster said he could not say when evacuation orders might be ordered this week, as the storm's models are still developing. The National Weather Service's John Quagliarielloro said current predictions show Hurricane Florence is expected to become a major hurricane by Monday night and could bring with it significant flash flooding and river flooding later in the week. South Carolina Adjutant General Maj. Gen. Robert E. Livingston, Jr. said 800 National Guardsmen have been activated to respond to Hurricane Florence. Another 285 state Guardsmen and 1,617 law enforcement officers have also been tapped to respond. The governor's update came the same day Horry County and Myrtle Beach, on South Carolina's northeast coast, declared states of emergency. At the Charleston County Emergency Operations Center on Sunday, officials from Berkeley, Charleston and Dorchester counties provided updates on preparedness ahead of the storm. None of the three shelters in Charleston County have been activated and will not open unless the governor issues an evacuation order, said Charleston County Spokesman Shawn Smetana. Each of the shelters can accommodate as many as 4,500 people. However, citing a recent engineering assessment of the Charleston County shelter sites, County Councilman Vic Rawl said the shelters cannot sustain category-three-level winds, or 130 mph. In the event Florence registers greater than category three, Charleston County residents would instead be housed in Berkeley, Dorchester and Orangeburg county shelters, he said. Pick-up points for those requiring transportation to the shelters would remain the same. Charleston City Council declared a state of emergency Sunday to be in concert with the South Carolina state government. With some uncertainty still tied to the storm's path officials warned the public to be prepared for what Florence would bring on a direct or near hit. "There is an increasing risk of two life-threatening impacts from Florence: storm surge at the coast and freshwater flooding from a prolonged heavy rainfall event inland," said Hurricane Center specialist Eric Blake. With Florence moving west, eyes elsewhere were on other storms in the Atlantic. Tropical Storm Isaac is expected to move into the outer Caribbean islands as hurricane with Tropical Storm Helene behind it. Michael Majchrowicz, Caitlin Byrd and Andy Shain contributed to this report.